FILE - U.S. Ambassador to the United Nations Nikki Haley speaks to reporters, Jan. 2, 2018, at U.N. headquarters. She said the "civilized world" must remain vigilant against North Korean weapons development. "We will never accept a nuclear North Korea." The U.S. ambassador to the United Nations, Nikki Haley, says it is "good for the United States" that North and South Korea are set to engage in high-level talks, but warned Pyongyang's nuclear weapons ambitions still pose a serious threat to the world. "This is a very dangerous situation," Haley told ABC News on Sunday. She said the United States is "not letting up on the pressure" to end North Korea's nuclear weapons development and warned, "We can destroy them, too." She said that if North Korean leader Kim Jong Un were to launch a nuclear attack on the United States, "It is not going to be us [The United States] that is destroyed." Numerous U.S. political figures say Trump's response unnecessarily inflamed tensions with North Korea, but Haley said, "You always have to keep Kim on his toes." She said before the United States would engage in serious talks with North Korea, Pyongyang would have to end its missile tests "for a significant amount of time" and be willing to discuss ending its use of nuclear weapons. 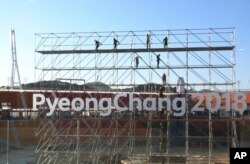 High-level officials from the two Koreas are slated to talk Tuesday about North Korea's possible participation in the Winter Olympics next month in South Korea, but it's uncertain whether longer-term relations between the two countries will be discussed. 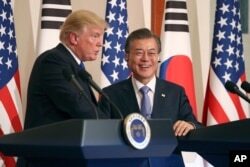 Trump said Saturday he hopes the newly arranged discussions between North and South Korea will go "beyond the Olympics" and promised the United States will take part "at the appropriate time." 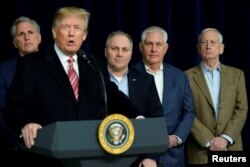 Trump gave an unusual news conference from the Camp David presidential retreat, where he met with Republican lawmakers. Of the upcoming talks between Seoul and Pyongyang, Trump said, "I hope it works out." "I would love to see them take it beyond the Olympics," he said. U.S. President Donald Trump speaks to the media after the Congressional Republican Leadership retreat at Camp David, Maryland, Jan. 6, 2018. FILE - President Donald Trump, left, speaks as South Korean President Moon Jae-in looks on during a joint news conference at the Blue House in Seoul, South Korea, Tuesday, Nov. 7, 2017. “You have to have a certain attitude and you have to be prepared to do certain things and I'm totally prepared to do that,'' Trump said, suggesting that his tough language has helped persuade the North to sit down with the South. Tuesday's talks are scheduled to take place at the truce village of Panmunjom in the heavily fortified demilitarized zone dividing the two Koreas.